Obviously, we have some factor to discuss before we get to our victor, so let's start with out first contenders.... Avon Anew Sheet Masks. Did you notice that? Masks. Avon gets an extra point right out of the gate as they offer two varieties with the a firming and brightening formula. We'll get back to momentarily. 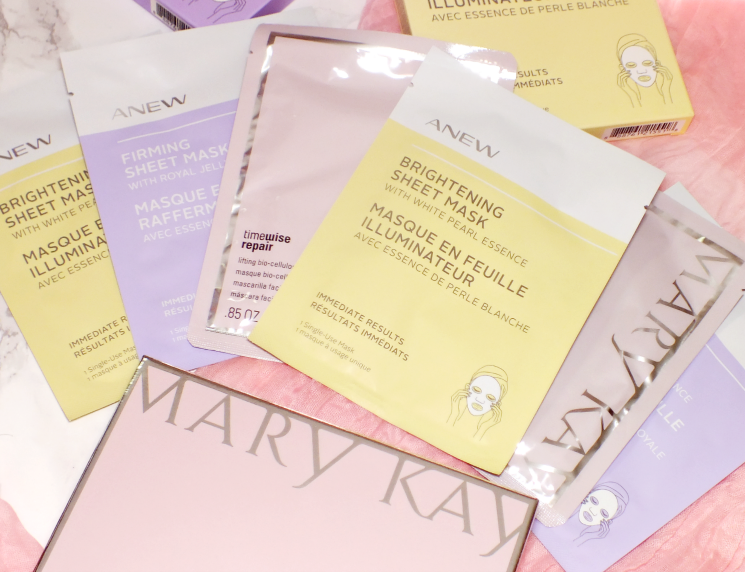 The Avon sheet masks are not only styled after the gooey Korean ones we all love, but they are in fact made in Korea for a fully authentic experience. As such, the masks are your stand paper-type sheet soaked in a serum/essence. The Avon Anew Firming Sheet Mask with Royal Jelly Essence features, you guessed it, royal jelly. If you're not up on your royal jelly facts, its the nectar (made of water and precious nutrients) that worker bees feed the queen. It is world-renowned for its anti-aging and firming properties. Along with being hydrating, this mask is formulated to firm, tone and lift. 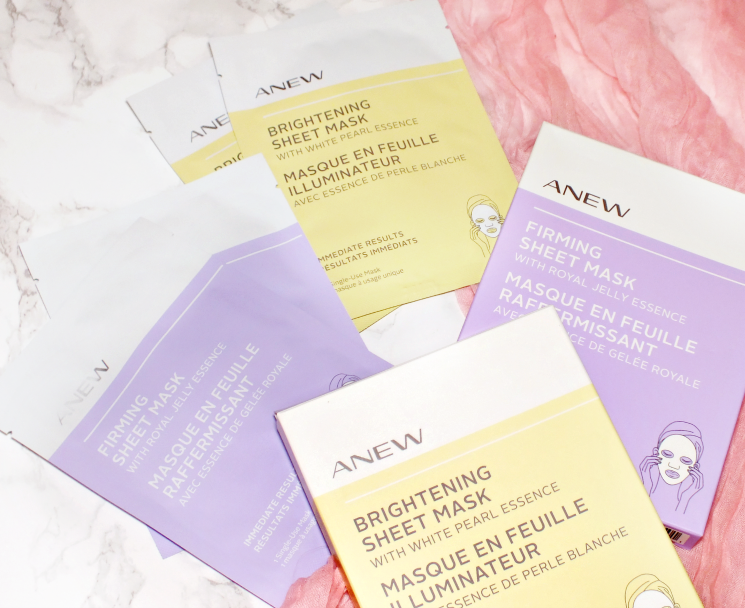 The Avon Anew Brightening Sheet Mask with White Pearl Essence, yup, features white pearl which is known as a skin brightener. Did you know pearls have seen used for over 3,000 years in skincare treatments in Egypt, China, and Japan? The centuries old ingredient adds a little radiance and refreshed look the effect of this mask. On to contender two... Mary Kay TimeWise Repair Lifting Bio-Cellulose Masks are made in Taiwan (just a boat ride across the East China Sea from Korea, aka a 935 mile trip.) Now, I know a smidgen about skincare, but I can't say Taiwan is known for producing quality skincare. Possibly a lost point for Ms. MK. Although, that point may be easily balanced out by the fact that these are celullose masks (coconut derived) which have the jelly feel that often fits / sits easier on the skin during use. So, both masks have their perks, and if used regularly do have some visible effect on skin. I say some, because I really didn't see a huge boost in firmness with either the Avon of MK firming mask. I did get the hydration boost, plumped and softened skin, and that fresh-faced effect from all three. When it comes to a winner though... I think I'm going to have side with Avon. I am always down for the potential of a brighter complexion and they don't break the bank. I like the fact that the Mary Kay masks are cellulose, but they ring in pretty pricey for what they are, and honestly, I'm never going to use two a week each week. Maybe if I did I'd get more firming action? 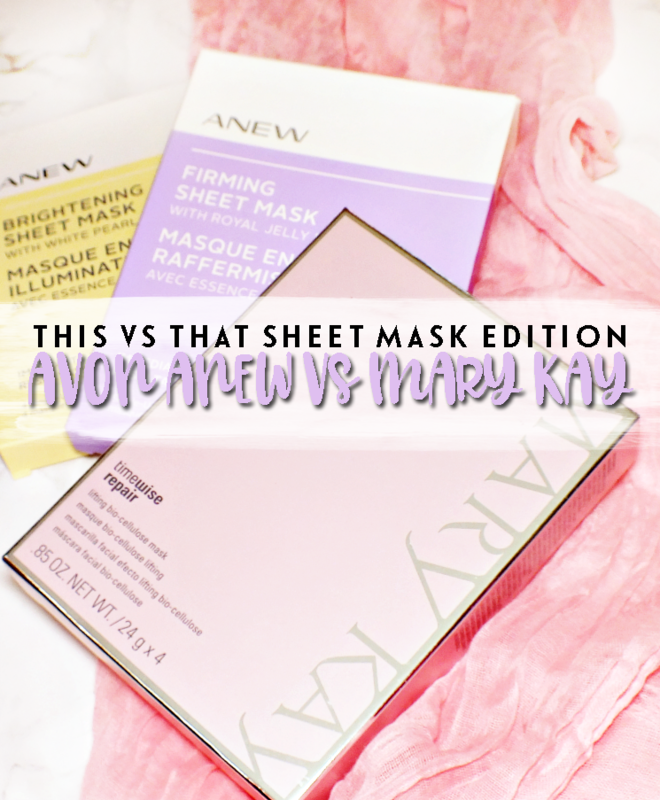 What do you think, are you a sheet masker? Which mask option sounds right for you?